Apparently, the answer to that question is, "No." UPDATE [4:28 p.m.] -- According to Mark Meany, executive sports editor at local ABC affiliate WPVI-TV (Channel 6), ESPN Monday Night Football analyst Jon Gruden has no interest in coaching the Philadelphia Eagles, or anywhere else for that matter. ESPN statement to me regarding Jon Gruden and #Eagles head coaching job: "Jon has no plans to go back to coaching. He's committed to ESPN." It was previously reported that Gruden, who spent 3 years with the Eagles from 1995-97 before leaving to become the Raiders head coach and ultimately winning a Super Bowl in 2002 with the Bucs, reached out to the team through an intermediary to express interest in the vacant position. According to the report, however, owner Jeffrey Lurie did not share Gruden's interest. On Thursday, I rounded up some of the coaching rumors that have been swirling around the Philadelphia Eagles since they released Chip Kelly last week. I included eight candidates -- and could have added a few more -- that have been linked to the Birds. I even lamented the frustrating nature of an NFL coaching search. And I didn't have to wait long to be proven correct. Shorty after the story was published, the Eagles confirmed that they interviewed New York Giants offensive coordinator Ben McAdoo, rendering my story almost immediately outdated. Could Gase help young Eagles WRs maximize potential? However, that wasn't the only bit of additional information to come out since. 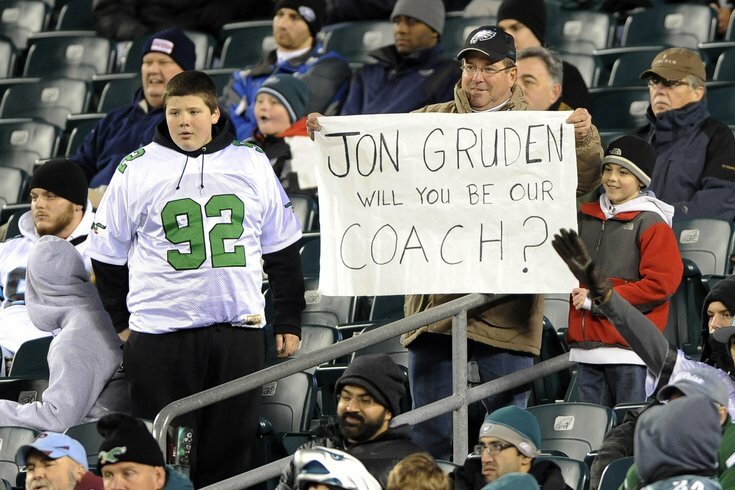 The latest Eagles coaching rumor involves a familiar name: Jon Gruden. And while the name alone may not be enough to surprise you -- his name was also floated out there when the Eagles were looking to replace Åndy Reid in 2013, ultimately opting for Kelly instead -- the fact that the interest is only coming from one side, Gruden's side, is a bit unexpected. The source said that while Lurie likes and respects Gruden, who was the Eagles' offensive coordinator in 1997-98, he has reservations about the ESPN Monday Night Football analyst's ability/willingness to play nice with Roseman, who has returned to a seat of personnel power now that Chip Kelly is gone. Gruden has told people that working with Roseman wouldn't be a problem. But Kelly said the same thing when he was hired in 2013, and look how that turned out. It's interesting that Lurie doesn't even seem interested in bringing Gruden in for an interview -- or even just to talk about where he stands on personnel and gauge his interest first-hand. That being said, it seems the team running the Eagles coaching search has an idea of what they want in their next leader. Look down the list of candidates they've interviewed or reportedly requested to interview and you'll find a bunch of current NFL assistants, all but one -- Eagles running backs coach Duce Staley -- a current offensive or defensive coordinator. *Names in bold have officially interviewed with Eagles. What you won't see are any college coaches -- perhaps Lurie is hesitant after how things ended with Kelly -- or, as it relates to Gruden, any former coaches. No Brian Billick. No Bill Cowher. And now, it seems, no Jon Gruden. Of course, given how quickly the rumor mill has been swirling in the 10 days since Kelly was handed his walking papers, that could change at any minute.